Rapport 2012 disponible en Anglais. 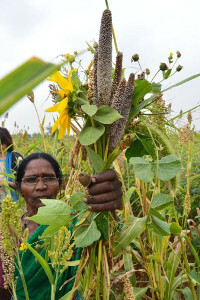 We open the 2012 Annual Report with the image of a woman from Pastapur (India) showing the wonderful plant combination she grows in her field. The Deccan Development Society (DDS) and the sanghams (organisations) of the Dalit women of Pastapur were “discovered” by some Consortium Members when DDS hosted the Consortium Fifth General Assembly in October 2012 (other Consortium members had been working with them for years). Indeed DDS and these women—who are now our most recent Member— provided an ideal setting for our meeting and its deliberations. They were as knowledgeable and inspiring in showing us their marvellous wealth of seeds—passed on from woman to woman, from farmer to farmer for generations— as they were welcoming and generous in sharing with us their food, their songs and the learning from their mix of cultivated and wild ICCA landscapes.